When five P-38 Lightnings gather in one place the news travels worldwide. Andrea Eldridge details the orchestration needed to make such an event successful. Long-time Reno participants consider Reno an extended family reunion. For Heather Penney, a new pilot in the Jet Class, it’s truly a family affair. In 1972, when Frank Arrufat flew to San Salvador to invest in a Corsair project he had no idea that 38 years later it would earn top honors. Now under the stewardship of new owner John O’Connor, this restoration by John Lane of Airpower Unlimited is a story of perseverance and perfection. 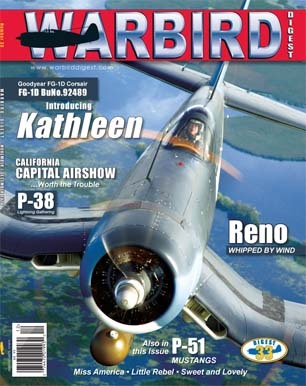 Race team member Jerry Day shares a history lesson about Brent Hisey’s beautiful P-51D Mustang and Unlimited Class Gold contender, then crew chief Greg Butler summarizes the team’s preparations for the 2010 Reno Air Races. The strongest field of Unlimited Class race teams in history prepared for the Breitling Gold, but what happened? Twin Mustangs for twin pilots— Bob Baker and his team restore a P-51 Mustang and reunite the Pattillo brothers with their past. In more than one way, it was a race against time.